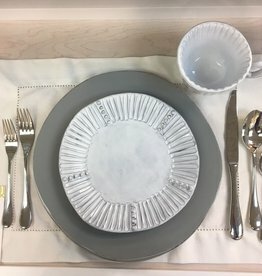 Alison and Ray Earl’s basic formal placesetting includes Oxford Place Dinner Plate, Salad Plate, Cup and Sauce by kate spade of new york for Lenox. 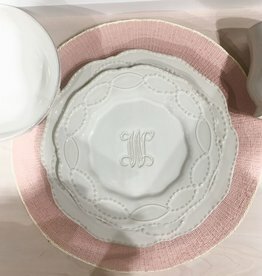 Monogrammed Bread and Butter plate from Pickard. All items may be purchased open stock as well. Custom add on to basic placesetting for Erica and John. Berry and Thread Pasta Bowl and Jardins du Monde Mug. 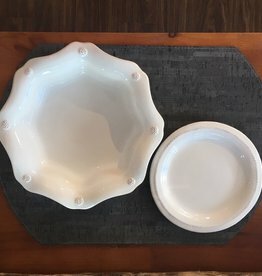 Both freezer-to-oven stoneware from Juliska. All items also available open stock. 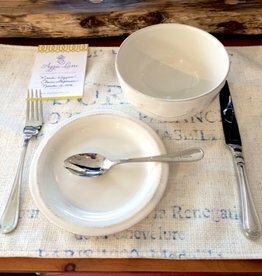 Custom placesetting created for Caroline Sorensen and Brent Banholzer. 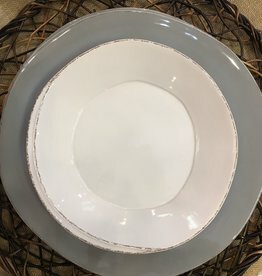 Includes Dinner Plate, Scalloped Dessert Plate and Cereal Bowl in Berry and Thread stoneware from Juliska. All pieces also available open stock. All items available open stock as well. 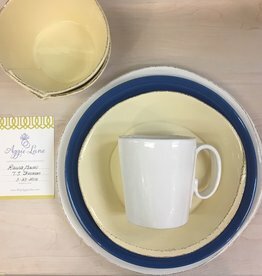 Includes Casafina Meridian Dinner Plate and Soup/Ice Cream Bowl, and Lenox French Pearle Accent Plate. All made from durable stoneware. All available open stock. 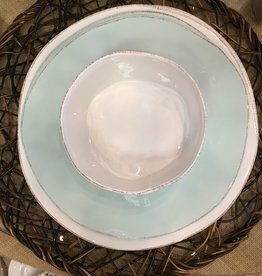 This custom setting for Laura Gaver and TJ Sherman mixes Vietri Lastra Stoneware that is finished by hand with a beautiful blue Fiesta salad plate. All dishwasher and microwave safe. 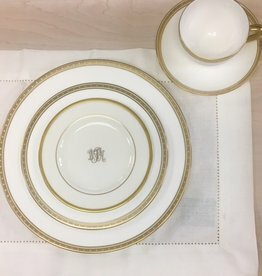 Custom basic placesetting for Erica and John includes Berry and Thread Dinner plate, Scalloped Dessert/Salad Plate, Jardins du Monde cocktail plate (also available as a set of 4). All freezer to oven stoneware from Juliska. Customized placesetting for Cody Fisher and Patrick Townes. 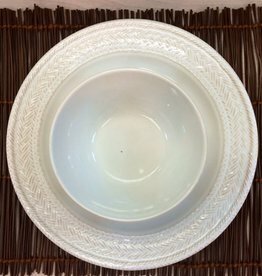 Includes Dinner Plate, Dessert/Salad Plate, and Cereal Bowl stoneware Berry & Thread pattern from Juliska. All pieces may be purchased individually as well. See CF+PT Add-On for complete setting. Nichole & Thomas’ placesetting is Le Panier from Juliska. Freezer to oven stoneware. Includes Dinner Plate, Cereal Bowl, and Mug. 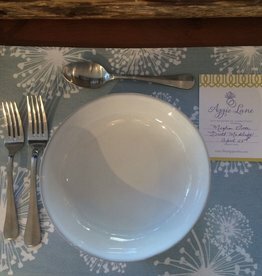 Custom placesetting add-on for Jessica Antley and Jordan Schipper. Includes Berry & Thread Glass Plate and Berry & Thread Small Glass Bowl. Custom placesetting for Jessica Antley and Jordan Schipper. 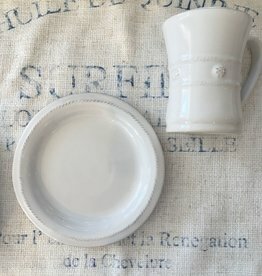 Includes Lastra Dinner Plate in gray, Incanto Stripe Salad Plate, Incanto Stripe Mug all from Vietri. 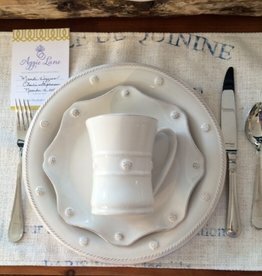 Vietri Lastra stoneware custom placesetting created for Krystin Conley & Cale Rogers. 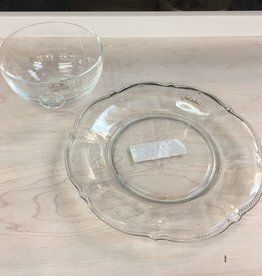 Includes white Dinner Plate, Salad Plate, and Cereal Bowl. Customized placesetting ADD-ON for Victoria Rivera & Andrew Kaley. Includes Berry & Thread Tea/Coffee Cup, Scalloped Saucer, Round Side Plate in Juliska stoneware Berry & Thread pattern. Custom 2 pc add-on for Stephanie King and Michael Holder. 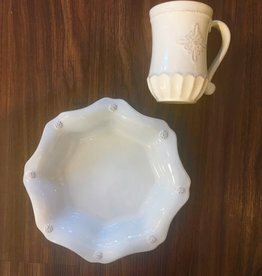 Includes Acanthus cereal bowl and side plate in freezer to oven stoneware from Juliska. Complete their setting with the 3 pc Acanathus placesetting. All pieces available open stock as well. Custom placesetting add-on for Caroline Sorensen and Brent Banholzer. 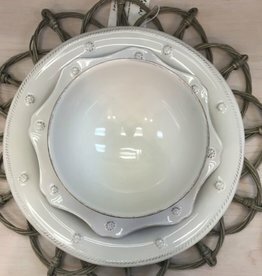 Includes Berry and Thread stoneware Scalloped Pasta Bowl and Side Plate from Juliska. All pieces also available open stock. Specify in store pick up for no shipping charges. Customized placesetting for Cody Fisher and Patrick Townes. Side Plate and Mug in stoneware Berry & Thread pattern from Juliska. All pieces may be purchased individually as well. See CF+PT Basic Placesetting for complete setting. Customized placesetting for Meghan Dover & Britt McGriff. Add on includes Juliska Quotidien Pasta Bowl & Side Plate. All pieces may be purchased individually as well. See M+B Basic for complete placesetting. 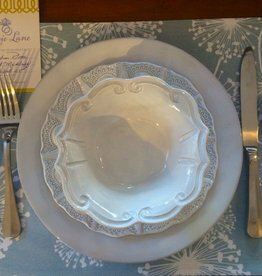 Custom placesetting add-on created for Mandi Wiggins and Charlie Stephenson. 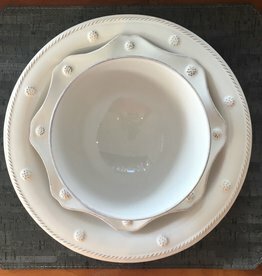 Juliska Berry & Thread Cereal Bowl & 7” Side Plate. Freezer-to-oven stoneware. See Mandi & Charlie’s Basic for additional pieces. 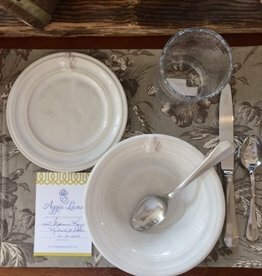 Custom placesetting created for Mandi Wiggins and Charlie Stephenson. Juliska Berry & Thread Dinner Plate, Scalloped Dessert Plate, and Mug. Freezer-to-oven stoneware. See Mandi & Charlie’s Add-On for additional pieces. Custom placesetting created for Danielle Tuck and Craig Hampy. All pieces available open stock as well. 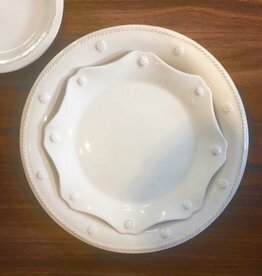 Includes Juliska Berry & Thread stoneware Dinner Plate, Scalloped Dessert/Salad Plate, and Round Side Plate . All freezer-to-oven stoneware.